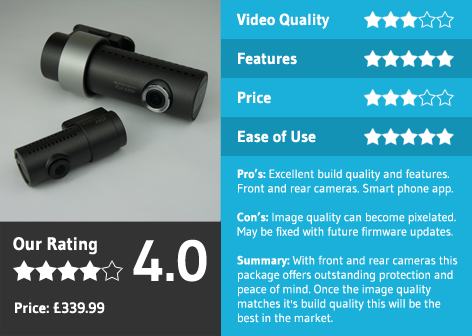 We've tested a lot of dash cams here at Car Camera Shop, but never before one with a rear-facing camera. 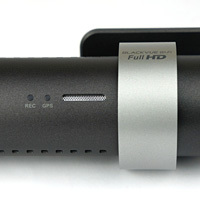 So when Pittasoft offered us a BlackVue DR550GW-HD to review, their first two-channel camera, we jumped at the chance. Having the ability to record behind your vehicle, as well as in front, greatly increases the chances of you capturing any activity that could lead to you needing to claim on your insurance. 139° wide angle lens with a 2.4MP Sony Exmor CMOS sensor. Upon opening the well-presented packaging, the build and design quality of both cameras is the first thing you notice, certainly in comparison to some of the budget range of cameras available in the market today. 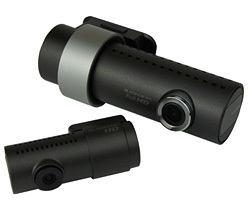 Continuing the sleek, barrel design of the existing BlackVue cameras, these are constructed of tough, beautifully finished plastic, with smart little design features, from the subtle placement of status LEDs to the touch-sensitive audio on/off sensor on the front camera. Even the air ventilation holes complement the design beautifully! There are also some nice finishing touches such as the BlackVue logo on the lens cap and even etched underneath the adhesive pad on the rear camera that, while not strictly necessary, really do paint the picture that this is a premium quality product. The camera isn't cluttered with buttons which helps retain its sense of style, but that doesn't mean that it's short on functionality either. At one end, a touch-sensitive panel enables you to turn audio recording on and off easily while driving and at the opposite end, alongside the power and rear camera connectors, a single button engages the DR550GW's own WiFi hotspot. This enables you to access a wealth of setting and options via your smartphone, but we'll talk more about that later! Installation was easy, and we were impressed with the quality of the cables provided. Every connection felt made-to-measure, particularly the AV in/out cable connecting the two cameras which clicked into place firmly. All cables were long enough to route around the car, completely hidden from view behind the trim and beneath the carpet. The only complication we encountered was the amount of slack cable required to allow our hatchback boot to open. This loop of cable couldn’t be hidden as well as we'd have liked when the boot was closed, but it didn’t cause any visibility issues in the slightest and wasn't very noticeable. There's definitely something very comforting about having a car camera installed. The peace-of-mind that comes from knowing you'll have footage if anything happens on the road is appreciated. So catching sight of the additional rear camera in our mirror was very welcome. Its subtle white LED let us know that it was powered up and recording. On powering up the camera for the first time we're welcomed with a voice message, "BlackVue for your safe driving". These voice prompts give you updates as to the status of the camera to make sure you it's all working properly. While they're a novelty at first, we eventually turned them off, preferring our camera to be seen and not heard. With this in mind, and despite the DR550-GW-HD being bigger than some cameras on the market, the main unit was discreetly hidden behind our rear-view mirror. Using the free BlackVue app, available for iOS and Android devices, you can adjust just about anything you could wish to on your camera. From the video brightness and g-sensor sensitivity to the length of videos being recorded and which voice alerts you wish to hear. It also lets you view a live feed of what the front and rear cameras are viewing which is invaluable in positioning them in your vehicle. More importantly, the app is one of the key ways in which you can view the videos that your camera has recorded and we were impressed at how easy it is to use. The video files are easily identified as either 'normal', 'event' or 'parking' and by being either front or rear facing videos. They can be easily filtered so you can access the files you want quickly and easily. Once playing, the videos streamed well from the camera and the image looked sharp. The view could be switched from front to back seamlessly at the push of a button. Depending on the device you're using, you might not quite be able to make out registration plate numbers, but rest assured that the detail will be there once you view them on a bigger screen, such as on your PC or Mac. The software provided is also intuitive and uses the same filtering system as the app to let you find the videos that you're looking for easily. Using a smart picture-in-picture mechanism, you're able to view the front and rear-facing footage simultaneously giving you a complete picture of activity around you at the time of any incident. To view more detail, the videos can be viewed at full screen size. The only issue we found with the footage was that at speed, areas of the video became blocky and pixelated which was disappointing. When stationary, both the front and rear images look very sharp but they quickly deteriorate as the cameras struggle to process the images. This issue is caused by the low bitrate that each camera has. Even updating the camera to the latest firmware, which improved the video quality, we still noticed issues with the image quality. We've contacted Pittasoft for comment and will update this review once we hear from them. With the dashcam community happy to feedback to manufacturers to help them develop their products, we'd like to think that future updates will help to resolve this issue. We also missed the ability to be able to lock video files of our choosing if, for example, something happened on the road around us that we wanted to keep a record of, but that we weren't directly involved in; for example, a near-miss between other cars on the road or some anti-social behavior. 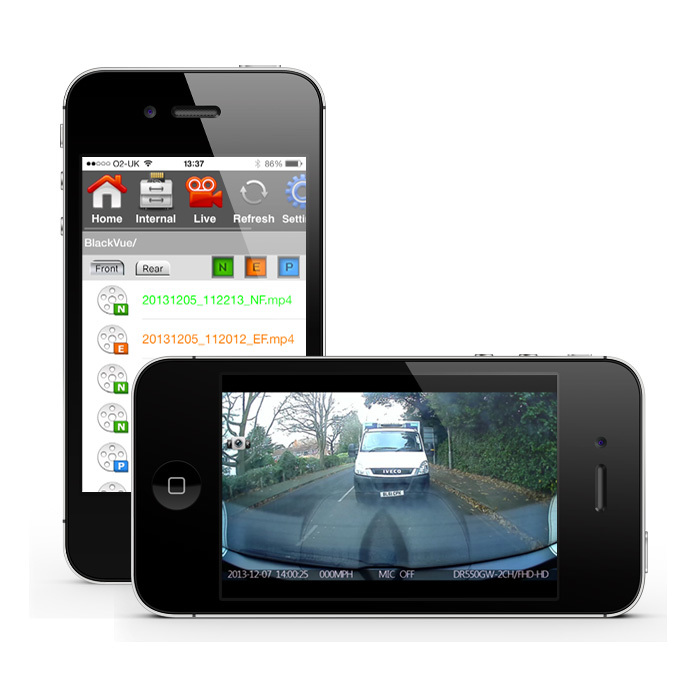 With other dashcams, you can press a button to create an ';event' file which won't be overwritten by the camera and will be kept safe. It's purely down to personal preference but we'd like to see this feature on the DR550GW-HD as we regularly use this feature on other test cameras. With so many people sharing video files of their experiences on the road nowadays, this is a very popular feature. And so, in conclusion, the BlackVue DR550GW-HD really does set the bar high in terms of build quality and features, but has improvements to make in the video quality department. We genuinely hope that future firmware updates will rectify the issues that the camera currently has, at which point this camera has the potential to become one of the best cameras on the market. Note: the software footage above appears jerky due to our screen capture software. On-screen the footage is perfectly smooth.